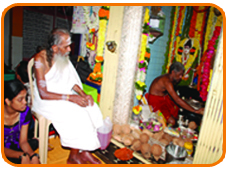 His Karmabhoomi is Pithapuram and his Tapobhoomi is Kuruvapuram, Presently known as Kuruvapur or Kurugadda of Raichur District, Karnataka. his Incarnation is started in Pithapuram and completed in Kuruvapuram. The tenure of Sripada Srivallabha Incarnation is too small, but its prominence is , which is not Possible Immense to explain even for celestials and Seven Sages. he is the support for all Visible and Invisible forces. 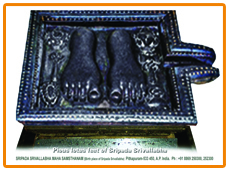 Sripada Srivallabha′s is a Comprehensive Yogic Incarnation. his body is an embodiment of Holy Fire and Yoga. The Divine Sripada Srivallabha was very bright, very Iustrous, Very Handsome and very tall. Infinite love and mercy were flowing from His both eyes as a big stream. He satisfies only with Inner Feelings. 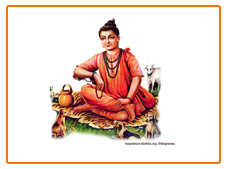 Sripada Srivallabha is Superior to ‘Dwaadasa Aadityas′. his Divine gross body is endowed with Wonderful divine Vibrations. Sripada Srivallabha is an embodiment of all Deities. his nature is a Magnificent One which Transcends all the forms of Deities. He is the Emperor of the fourteen worlds. He Dwells in all Countries and at all Times. Sripada′s descent will always take place in the subtle worlds of higher Regions.